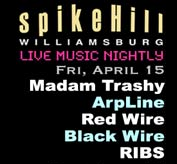 Trekking to hipster land a.k.a Brooklyn tonight to hear my friends’ band, RIBS. I’m obsessed with their album British Brains and their newly released Locrian Singles, and I am excited to see them and absorb their sounds into my brain. Are friends allowed to review their friends’ shows? I’m going to make the rules and reply with a triumphant “Yes”. Review of show to follow.